- Bill Nye, Chief Executive Officer of The Planetary Society (click). meteoroid, approx. size 15 meters, 7000 metric tons, impacted Earth near Chelyabinsk, Russia at about 3:20h UTC, speed 18 km/sec, 20° from NEE; It traveled through the atmosphere for about 30 seconds before breaking apart and producing violent airburst ‘explosion’ about 20-14 km above Earth’s surface, producing an energy shockwave equivalent to a 300 kilotons TNT explosion. That energy propagated down through the atmosphere, stuck the city below – the Chelyabinsk region has a population of about 1 million — and windows were broken, walls collapsed and there were other reports of minor damage throughout the city. asteroid 2012 DA14, size 45 meters, passed within 27,700 km Earth, speed 7.8 km/sec. 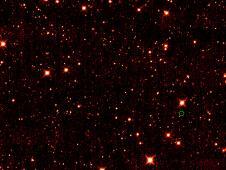 Fly with the New Horizons spacecraft as it cruises by dozens of newly-discovered Kuiper Belt Objects (KBOs) near its trajectory. These objects were found by our survey team (gray points) as well as by members of the public through Ice Hunters (purple points) during a search - still under way - to find a KBO for New Horizons to approach close enough to take detailed images and measurements of its surface. See below for details. Animation concept and rendering by Alex Harrison Parker, Harvard-Smithsonian Center for Astrophysics. Data from NASA's Voyager 1 spacecraft indicate that the venerable deep-space explorer has encountered a region in space where the intensity of charged particles from beyond our solar system has markedly increased. Voyager scientists looking at this rapid rise draw closer to an inevitable but historic conclusion - that humanity's first emissary to interstellar space is on the edge of our solar system. "The laws of physics say that someday Voyager will become the first human-made object to enter interstellar space, but we still do not know exactly when that someday will be," said Ed Stone, Voyager project scientist at the California Institute of Technology in Pasadena. "The latest data indicate that we are clearly in a new region where things are changing more quickly. It is very exciting. We are approaching the solar system's frontier." The data making the 16-hour-38 minute, 11.1-billion-mile (17.8-billion-kilometer), journey from Voyager 1 to antennas of NASA's Deep Space Network on Earth detail the number of charged particles measured by the two High Energy telescopes aboard the 34-year-old spacecraft. These energetic particles were generated when stars in our cosmic neighborhood went supernova. Dione, one of Saturn’s icy moons, has a weak exosphere that includes molecules of oxygen, according to new findings from the Cassini-Huygens mission. The international mission made the discovery using combined data from the Cassini Plasma Spectrometer (CAPS), which includes a sensor designed and built at the University College London’s (UCL) Mullard Space Science Laboratory. Dione joins Rhea and the main rings in Saturn's system in having an oxygen-rich exosphere, as well as Jupiter’s moons Ganymede, Europa, and Callisto — the target for the European Space Agency’s (ESA) proposed Jupiter Icy Moons Explorer (JUICE) mission for launch in 2022 ( http://www.esa.int/esaCP/SEM9I4QWJ1H_index_0.html ). A planet with two suns may be a familiar sight to fans of the Star Wars film series, but not, until now, to scientists. A team of researchers, including Carnegie's Alan Boss, has discovered a planet that orbits around a pair of stars. This is the first instance of astronomers finding direct evidence of a so-called circum-binary planet. A few other planets have been suspected of orbiting around both members of a dual-star system, but the transits of the circumbinary planet have never been detected previously. The team, led by Laurance Doyle from the Carl Sagan Center for the Study of Life in the Universe at the SETI Institute in Mountain View, California, used photometric data from NASA’s Kepler space telescope, which monitors the brightness of 155,000 stars. In addition to the usual two eclipses (primary and secondary ones), they found also tertiary and quaternary eclipses, indicating a presence of a third eclipsing body. Nature (11-JAN-2012) reports "Most Sun-like stars in the Galaxy reside in gravitationally bound pairs of stars (binaries). Although long anticipated, the existence of a ‘circumbinary planet’ orbiting such a pair of normal stars was not definitively established until the discovery of the planet transiting (that is, passing in front of) Kepler-16. Questions remained, however, about the prevalence of circumbinary planets and their range of orbital and physical properties. Here we report two additional transiting circumbinary planets: Kepler-34 (AB)b and Kepler-35 (AB)b, referred to here as Kepler-34 b and Kepler-35 b, respectively. Each is a low-density gas-giant planet on an orbit closely aligned with that of its parent stars. Kepler-34 b orbits two Sun-like stars every 289 days, whereas Kepler-35 b orbits a pair of smaller stars (89% and 81% of the Sun’s mass) every 131 days. The planets experience large multi-periodic variations in incident stellar radiation arising from the orbital motion of the stars. The observed rate of circumbinary planets in our sample implies that more than ~1% of close binary stars have giant planets in nearly coplanar orbits, yielding a Galactic population of at least several million." Pluto has long time been considered the last planet of our solar system, fitting, however no of the two basic planet categories: Earth-like (terrestrial) and Jupiter-like (Jovian), so Pluto has been an extra planet representing itself: During closest approach to Sun, an eclipsing with a background star, a lot information has been obtained about Pluto: its more exact diameter, and absorption spectral analysis of the released gases - very thin atmosphere. Then, the eclipsing with its moon Charon provided even more accurate diameters of the both objects, Charon's orbital period synchronized with Pluto's rotational period (tidal locking), masses and densities of the both objects. 23-JUN-2011, the most unique study of the Pluto's transit over a distant star succeeded from a highly modified Boeing 747SP aircraft. It carries a telescope with a 100-inch (2.5-meter) mirror that conducts astronomy research not possible with ground-based telescopes. By operating in the stratosphere at altitudes up to about14 km, SOFIA makes observations above the water vapor in Earth's lower atmosphere. The study contributes to our knowledge of the Pluto's atmosphere structure. New Horizons is a space mission to the solar system edge, specifically the Pluto System and the Kuiper Belt. The National Academy of Sciences, U. S. A., has ranked the exploration of the highest priority for solar system exploration. Pluto and its largest moon Charon belong to a third category known as "ice dwarfs". They have solid surfaces but, unlike the terrestrial planets, a significant portion of their mass is icy material. 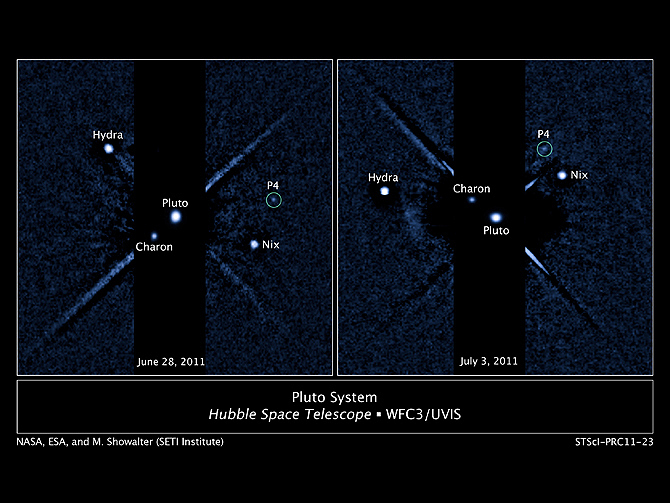 In 2006, using Hubble Space Telescope images, New Horizons team members discovered two previously unknown moons of Pluto, Nix and Hydra (see above). Where is New Horizons now? As the fastest object created by man, moving about 1 million km/day, it is 22.44 AU distant from Earth already today, 18-JUN-2012, 00:00h UTC (see below). Please note that the time for a command signal to and back from the spacecraft (signal confirmation), sent per microvawes traveling with the speed of light takes almost six and half hours (round-trip light time, at the bottom of the graphic). Today, Monday January 16, 2012, the New Horizons Team fulfilling that wish mourns Patsy Tombaugh, who died Jan. 12 at age 99. "When we explore Pluto in three years, she will be as much on our minds and our hearts, as she is today," says New Horizons Principal Investigator Alan Stern. For more than three decades, the central black hole in the supergiant elliptical galaxy M87 — at 6.3 billion solar masses —has been regarded as the most massive known black hole in the Universe. This paper reports two galaxies containing black holes that exceed that figure. Have you seen the bright "star" near the full moon? Of course - it is Jupiter: So bright could also Venus be, but Venus could not "move" with the moon that far from the sun: as by "full moon" definition, the full moon is opposite to the sun. The Moon and Jupiter are separating now, but they'll be together again within the Moon’s sidereal period (27.321661 days): the sun moves eastward about 1°/day (360°/365.2564 days) = about 27° (26.928474° more exactly) eastward. This is why the moon needs slightly more than two days to catch up with the sun to reach the same phase. Thus one cycle of lunar phases takes 29.53 days (Moon’s synodic[phase] period).. This takes a little less than a month — on Nov. 8th and 9th. Until then, browse the links in Space Weather for what you might have missed. The impact of a coronal mass ejection resulted in strong compression of our planet’s magnetosphere. A strong-to-severe geomagnetic storm is subsiding following the impact of a coronal mass ejection (CME) at approximately 8:15 a.m. EDT September 26. 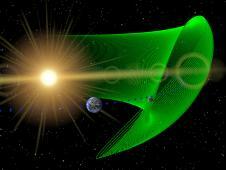 The Goddard Space Weather Lab reported a strong compression of Earth's magnetosphere. Simulations indicate that solar wind plasma penetrated close to geosynchronous orbit at 9 a.m. Geosynchronous satellites could therefore be directly exposed to solar wind plasma and magnetic fields. Clear locations as far south as the northern United States were witness to aurorae due to the storm. Skywatchers at the highest latitudes should remain alert for northern lights as Earth's magnetic field continues to reverberate from the CME impact. Auroras are actually the result of collisions between gaseous particles in the (Earth's) atmosphere with charged particles released from the Sun's atmosphere. Variations in color are due to the type of gas particles that are colliding. The most common auroral color, a pale yellowish-green, is produced by oxygen molecules located about 100 km above the Earth. Rare, all-red auroras are produced by high-altitude oxygen, at heights of up to 320 km. Nitrogen produces blue or purplish-red aurora. A comet is diving into the sun today. Just discovered by comet hunters Michal Kusiak of Poland and Sergei Schmalz of Germany, the icy visitor from the outer solar system is expected to brighten to first magnitude before it disintegrates on Sept. 14th. The Solar and Heliospheric Observatory is monitoring the comet's death plunge: finder chart, movie, latest images. PASADENA, Calif. – Astronomers studying observations taken by NASA's Wide-field Infrared Survey Explorer (WISE) mission have discovered the first known "Trojan" asteroid orbiting the Sun along with Earth. The asteroid is roughly 300 meters in diameter. It has an unusual orbit that traces a complex motion near a stable point in the plane of Earth's orbit, although the asteroid also moves above and below the plane. The object is about 80 million kilometers from Earth. The asteroid's orbit is well-defined and for at least the next 100 years, it will not come closer to Earth than 24 million kilometers. An animation showing the orbit is available at: http://www.nasa.gov/multimedia/videogallery/index.html?media_id=103550791 . Cruithne is an asteroid that is sometimes referred to as Earth's 2nd moon. While this might be stretching the definition of moon a bit, Cruithne does have a very interesting orbit which is heavily influenced by Earth. The simulation cruithne.gsim shows Cruithne in a rotating frame. Watch as it orbits the Sun in a kidney bean shape orbit. The Earth has a noticable effect on Cruithne's orbit, sometimes repelling it as it gets too close. Cruithne's kidney bean-shaped "orbit" then spends centuries travelling all the way around the Sun, just to meet the Earth from the other side. Earth once again repels the kidney bean-shaped orbit. Cruithne's kidney-bean orbit repeats this process over and over again. 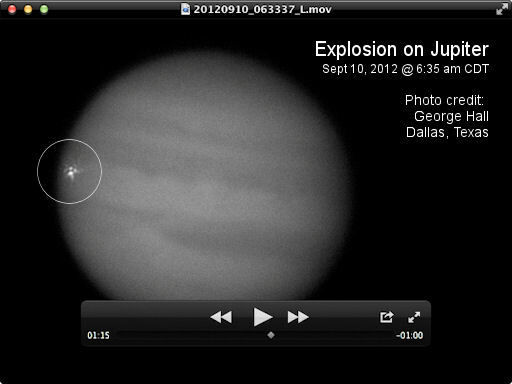 Starting conditions were obtained using JPL Horizons Ephemeris Computation Service. Cruithne has an orbit that stretches from the orbit of Mercury to beyond the orbit of Mars. But remarkably, Cruithne's period is almost exactly the same as Earth's. This sets the table for some interesting orbital interactions. Cruithne's orbit is highly inclined compared to the the orbits of the planets. In this simulation the Earth and Moon trace an oval in a rotating frame that matches their solar period. Because the Earth's orbit is slightly elliptical, sometimes it is closer to the Sun than its average distance, and sometimes it is further. When it is closer, it also moves slightly faster in its orbit, causing it to advance slightly from its average position. When it is further from the Sun, it moves slightly slower, causing it to fall behind its average position. This is why the Earth / Moon system traces an oval instead of appearing as a fixed point. In 1997, Cruithne's horseshoe orbit caused it to make close encounters with Earth on an annual basis. But Cruithne's kidney bean-shaped orbit is distancing itself from the Earth with each orbit. In the year 2110, Cruithne traces its kidney bean-shaped orbit aroundEarth's Lagrange 3 point. In the year 2277, Cruithne's kidney bean-shaped orbit encounter Earth. Earth's gravity raises Cruithne's orbit slightly. The higher orbit means Cruithne has a slower speed in its orbit around the Sun. Cruithne begins to retreat from the Earth. Cruithne will return to this point 752 years later in the year 3029. Three centuries later, Cruithne's kidney bean-shaped "orbit" approached Earth from the other direction, and the leading edge advanced past Earth. Because of Cruithne's inclination, the asteroid was well below Earth at the time. Out of Earth's gravitational grasp, the asteroid's kidney bean-shaped "orbit" continued to march clockwise. In the year 2647 the trailing edge of Cruithne's kidney bean-shaped "orbit" approached the Earth. This time, Cruithne's inclination was not sufficient to keep Cruithne a safe distance from Earth's gravitational grasp. Earth's gravity slowed the asteroid down. But the slowdown was only temporary. It actually caused Cruithne to drop into a faster orbit. Once again, its kidney bean-shaped "orbit" reversed direction. WEBB, the James Webb Space Telescope (sometimes called JWST) will be a large infrared telescope with a 6.5-meter primary mirror. Webb was formerly known as the "Next Generation Space Telescope" (NGST); it was renamed in Sept. 2002 after a former NASA administrator, James Webb. Launch is planned for 2018. JWST will reside in an orbit about at L2 (Lagrangian point 2), 1.5 million km from the Earth: http://www.jwst.nasa.gov/orbit.html Its mirror's 6.5 m total diameter consists of 18 hexagonal segments, each 1.3 m in diameter, and having a mass of approximately 20 kg. These extremely lightweight mirrors are made of beryllium, the lightest hard metal we know. A strange little sunspot noticed on 31-Jul-06 may herald the coming of an unusually stormy solar cycle. '... a tiny sunspot was born. It popped up from the Sun's interior, floated around a bit, and vanished again in a few hours. On the Sun this sort of thing happens all the time and, ordinarily, it wouldn't be worth mentioning. But this sunspot was special: It was backward. Sunspots are planet-sized magnets created by the Sun's inner magnetic dynamo. Like all magnets, sunspots have north (N) and south (S) magnetic poles. The sunspot of July 31st popped up at solar longitude 65o W, latitude 13o S. Sunspots in that area are normally oriented N-S. The newcomer, however, was S-N, opposite the norm. Above: A SOHO magnetogram of the Sun. July 31, 2006. This tiny spot of backwardness matters because of what it might foretell: A really big solar cycle. Solar activity rises and falls in 11-year cycles, swinging back and forth between times of quiet and storminess. Right now the sun is quiet. "We're near the end of Solar Cycle 23, which peaked way back in 2001," explains Hathaway. The next cycle, Solar Cycle 24, should begin "any time now," returning the Sun to a stormy state. Satellite operators and NASA mission planners are bracing for this next solar cycle because it is expected to be exceptionally stormy, perhaps the stormiest in decades. Sunspots and solar flares will return in abundance, producing bright auroras on Earth and dangerous proton storms in space: full story. But when will Solar Cycle 24 begin? First, the sunspot lasted only three hours. Typically, sunspots last days, weeks or even months. Three hours is fleeting in the extreme. "It came and went so fast, it was not given an official sunspot number," says Hathaway. The astronomers who number sunspots didn't think it worthy! "On January 4, 2008, a reversed-polarity sunspot appeared—and this signals the start of Solar Cycle 24," says David Hathaway of the Marshall Space Flight Center (click).